I strive to spend quiet time with the Lord each day. In all honesty, when I look back at the end of each week, I often find that I've skipped that precious time once (or more!) and excuse myself because of the busy-ness of life. But that's just an excuse; the truth is that I have time every day to be alone with the Lord, but I choose to do other things instead. At the beginning of the year, I once again committed to this time with the Lord. 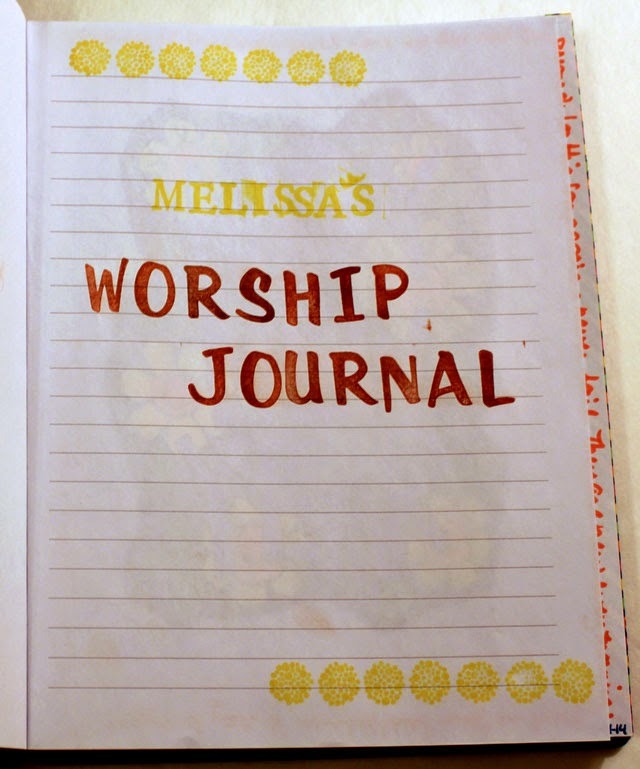 This year I'm adding some creativity into those quiet times in the forms of a Worship Journal, Bible Journaling, and merging art and faith in a way that helps me give honor to my Savior. I chose a nice leather journal that's been in my stash for a couple of years to use as a Worship Journal, a place where I can record scriptures, lessons I'm learning, and sermon notes. I started by removing about a third of the pages from this bound journal. Then, using INSPIRATION from Stephanie Ackerman's Documented Faith journal, I put washi tape along the edge of every other page. 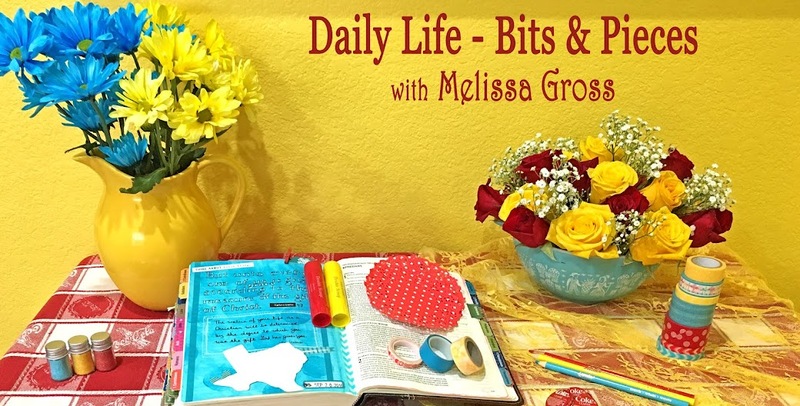 This is not necessarily a daily journal, rather it's one that I pick up during my quiet time to reinforce a scripture or message that I feel the Lord speaking to me through my Bible reading or a recent sermon or conversation. I actually got artsy on the inside of the front cover during the Truth Scrap event at the end of January. 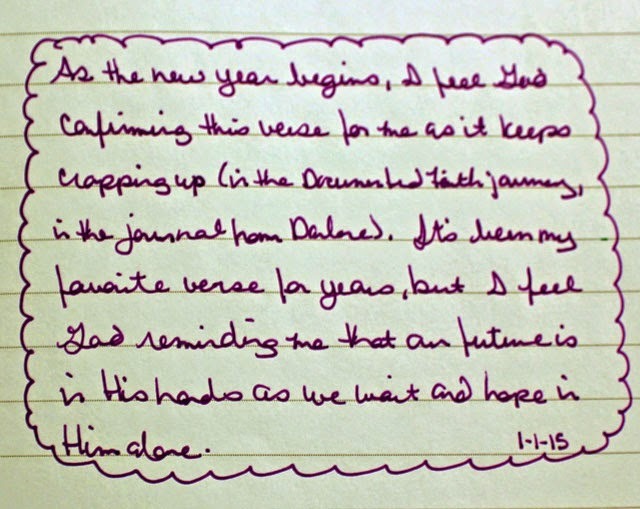 I love the idea of this journal being a journey of faith. I used some stamps to create a very basic title page (which I may add to at a later date). 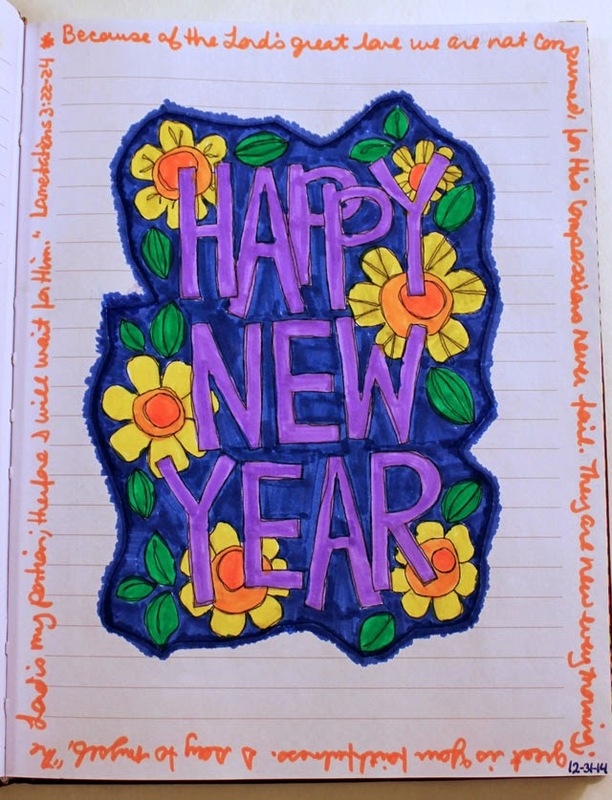 On the following page, I printed and colored the Happy New Year Coloring Page from Stephanie Ackerman and added a scripture around the outside of the page. 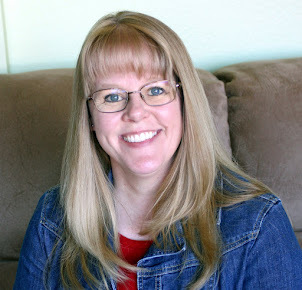 On January 1, I created a page using the first Document Faith prompt. I included a little personal journaling as well. I originally thought I'd follow along with the prompts in the Document Faith journey throughout the year, however after completing this first page I am basically just doing my own thing and using this journal when INSPIRATION strikes. 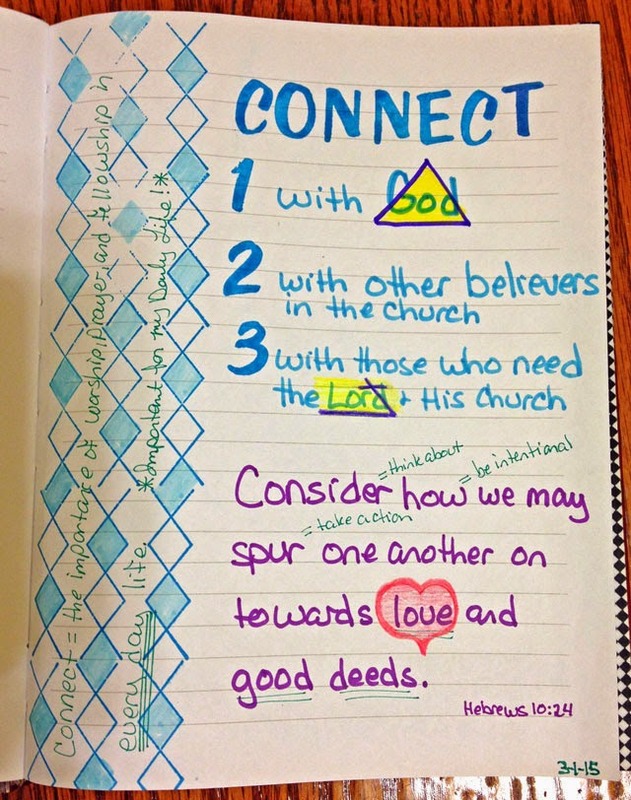 For example, here's a page I created after hearing a sermon in early March. As you can see, this is not a fancy art journal filled with masterpieces. 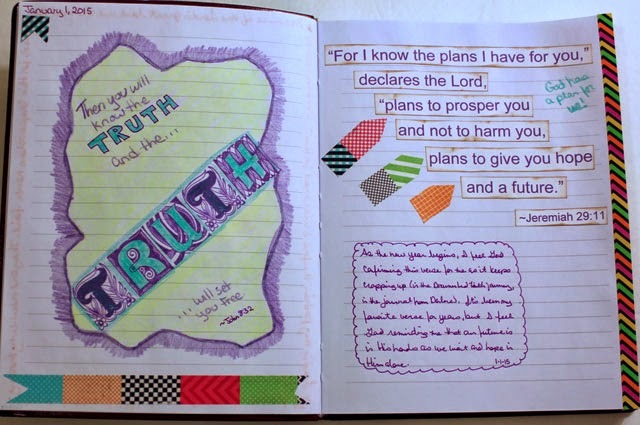 It's simply a place that I can play with colored pencils and markers and stamps and pens while I contemplate various scriptures and messages related to my faith. I'm truly enjoying this form of worship and feel that's is a wonderful addition to the time I spend with The Creator! Do you have a quiet time practice? What types of activities do you include during that time? Creativity and spirituality entwined - feels so appropriate, and I hope you continue to enjoy the way they nourish each other. this is wonderful! I might have to start one for my quiet time too. What a beautiful journal! I especially love the title page. I started a small notebook about prayer, but never considered doing any artwork in it. Yours is just lovely. This is fabulous, Melissa! 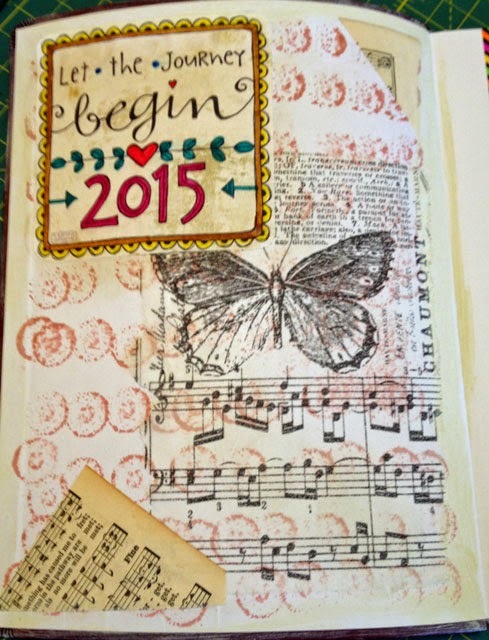 I love your artwork in your journal. So pretty!